Group Work: Are You Doing It Effectively? We’d like to welcome Larry Jarocki, MA Applied Linguistics, as a guest author of the ICAL Blog. Larry has been an ICAL tutor for over a decade. Here he talks about his recent findings on effective group work in the ESL classroom, following an eight days seminar on Cooperative Learning. As a practicing ESL and English teacher for nearly two decades, I’d seen and conducted many lessons involving group work. The idea was simple: put students in small learning groups, assign each person a job, and let the groups work through tasks and teach each other. Because having smaller numbers working together allowed for more student-student interaction, group work seemed particularly suited for language classrooms, where students benefited from increased practice and production. Though many of these lessons were successful, I always had a sneaking suspicion that things weren’t running as smoothly as they should. The typical scenario, particularly with groups containing students of differing ability levels, had one or two students doing most of the work, while another student watched and the fourth stared off into space. In my own lessons, I experimented with jig-sawing information and creating elaborate worksheets for the groups to complete, but the results were usually the same—uneven practice and learning. It wasn’t until I attended eight days of cooperative learning seminars that I realized what was needed to fix group work in the ESL classroom. 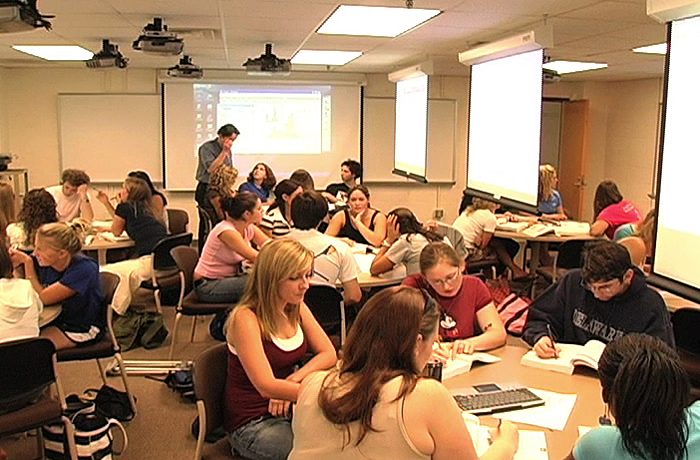 Group work could be highly effective, provided certain conditions were present. If any of these were lacking, the efficacy of an activity suffered. First of all, the students need to have a reason to be working with each other. Rather than competing, they should have a common goal, one that will benefit everyone. In other words, success for one becomes success for all. Each person should be adding something to the project so that all parts are necessary to complete it. Jigsaw activities are a good example of this, though there are many other forms out there. Second, every person needs to be held accountable for their performance. No student in a group should be able to remain silent or not demonstrate the desired learning. Some sort of public performance, whether in the group or in a later whole-class setting is required, and this performance should be done without help from the others. This might take the form of each person performing for the group prior to their efforts being combined, or you might have all the students prepare for performance and then randomly choose one student to present the group’s work. If everyone’s success is dependent on the outcome, all will have to prepare to represent their group. Third, you need to ensure that everyone’s participation is equal, be it by time on task or taking turns. This one is particularly important when you have students that tend to dominate groups. Giving each student a specific time limit for their performance can ensure that everyone shares the spotlight; if students are practicing free speaking on a topic, for example, you could limit each to thirty seconds, with you playing timer for the whole class. Equality can also come about when everyone has a turn to demonstrate their knowledge, as when you give a group a worksheet and have each student do two problems and then pass it on. The final necessary element involves keeping as many people working at the same time as possible. In a whole-class activity, you tend to have one or two students working on a task, with the rest watching and waiting for their turn. In a class of twenty students, that leaves about 90% of the class inactive at any given moment. Put them in groups, and you’ve got at least 25% active at any given moment. If the students are interacting with each other in the activity, that number can jump to fifty, seventy-five, or even one hundred percent. When planning activities for your classes, keep these four conditions in mind. While everything you have your students do in their groups might not fulfill all these requirements, the closer you can get to ensuring that all four are present, the more effective your cooperative learning activities will be. Our Larry on his coffe break!